Out of the Furnace is about injustice. It is this way because it follows a man seeking revenge against the hillbilly gangster who murdered his brother when the authorities can not deliver redress swiftly enough. And, less ostensibly, it is this way because almost all of the players in this revenge tale have tried to live a part of the American Dream and been failed miserably by the institutions that are supposed to help deliver on that promise. Less ostensibly does not mean subtly in this instance. There isn't much nuance in the way this film goes about making its point, but that doesn't render it ineffective. 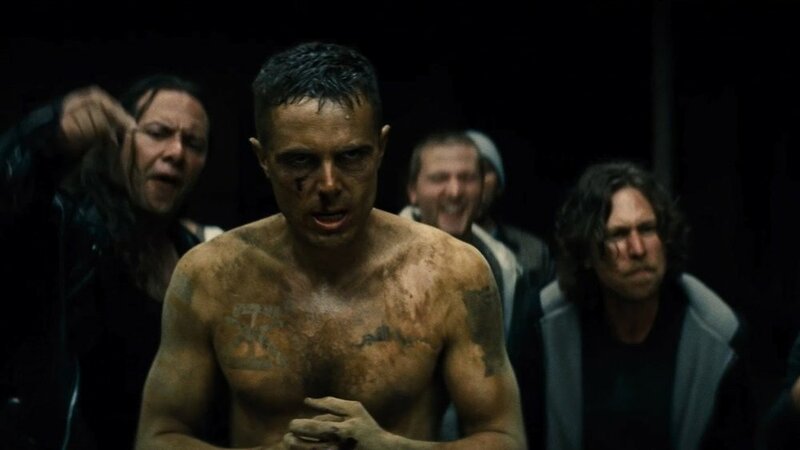 Christian Bale and Casey Affleck portray the star-crossed Baze brothers central to the story. Bale playing Russell, the elder sibling who ekes out a living working at a mill in Western Pennsylvania and struggling to balance his relationship with his girlfriend Lena (Zoe Saldana), care for his dying father and looking out for his younger brother Rodney Jr., a veteran of multiple tours in Iraq who, when he's stateside, piles up gambling debts. It's a delicate balance that Russell is able to maintain until a fatal drunk driving accident lands him in prison. This is a life-shattering event not just for him but for Rodney, who is clearly battling post-traumatic stress disorder in some form, and who is left without a safety net of any kind -- giving him one more reason to descend further in to the underworld that seems to be enveloping his hometown. When Russell's multi-year sentence sentence is up, it's basically already too late for his brother whose debts to a small-time tough played by Willem Dafoe have entangled him in the local underground fighting scene. There's a deep nihilism to Rodney's actions. He's apparently supposed to take a dive in most of his fights, but never does, overcome by the adrenaline or, maybe, just plain pissed off at the world. Naturally, it only leads to deeper debts. Despite his complete unreliability in the ring, he and Dafoe's character, John Petty, head to New Jersey, where the former is supposed to take a dive in a much more lucrative fight put on by Harlan DeGroat. DeGroat, who is played by Woody Harrelson, is a menacing presence -- a tweaked-out sociopath with bad teeth and a raspy laugh. The idea is that Rodney's dive will clear his debts to Petty and Petty's debts to DeGroat. With the sense of despair that looms over the entire film, there's little doubt that things will end poorly for the pair, and indeed they do. DeGroat executes both on their way back to Pennsylvania even though Rodney did end up taking the dive. It is Harrelson that injects life in to the film. You see DeGroat, a sleazy villain if ever there was one, in the film's opening scene as he delivers a vicious beating to a man at a drive-in movie theater, then hardly at all for the rest of the first half. He is a promise to the audience in that sense. Stick with us through the slow-developing Baze brothers backstory and DeGroat will be waiting on the other side. When he does finally reappear, the to-that-point plodding story is kicked in to high gear, the scenes with him, Affleck and Dafoe crackling and Bale's subsequent pursuit of him ratcheting up the tension. Bale's character is not righteous, but rather desperate and hopeless. The police -- in the form of Forest Whitaker -- are too slow to apprehend DeGroat, but Russell's criminal record doesn't exactly make it easy to take matters in to his own hands, to say nothing of the danger that awaits him in the hills -- yes, the hills -- of New Jersey. There are no good options for Russell when his brother disappears, the underlying message from director Scott Cooper being that, for this particular slice of America, a lack of options is an all too common phenomenon. It's a bit heavy-handed to get this across by making Rodney a veteran of the War on Terror and Russell a parolee of the state penitentiary, but again that doesn't make his point invalid. There are some nice subtle touches too. Geography is everything here. The Baze brothers' Pennsylvania town is severely depressed, a perfect portrait of Rust Belt decay. When Bale scrapes paint from his father's house early on in the film, you feel like the entire town might as well be one old, chipping paint job. I'm not sure if having DeGroat hail from New Jersey's Ramapo Mountains was an intentional choice, but if it was, it was a powerful touch. Harrelson's snarling visage conjures up West Virginia or Kentucky far more than it does the most densely populated state in the union. But the Ramapo Mountains are a very real place -- a stone's throw from New York City, relatively speaking. It's a setting that screams at urban viewers like myself: this America is quite real, and it is much closer to your house than you think. A quicker start and a few more subtle but powerful touches would have further elevated Out of the Furnace. Even so, if you can stomach something that's relentlessly foreboding, this film has plenty to offer.